The Electro Harmonix Crying Bass is the first bass-specific model in the innovative Next Step range. For the uninitiated, this range of pedals revolutionised the typical ‘rocker’ expression style pedal (such as wah, and volume pedals) by removing all moving parts. These are the parts that typically wear out on this type of pedal, so the Next Step pedal is far more hard wearing as a result. The one-piece uses some sort of motion sensing technology in conjunction with a one-piece chassis design that is wedge-shaped at one end. The pedal can rocked back and forth thanks to its shape, operating the effect, without the need for any other parts. 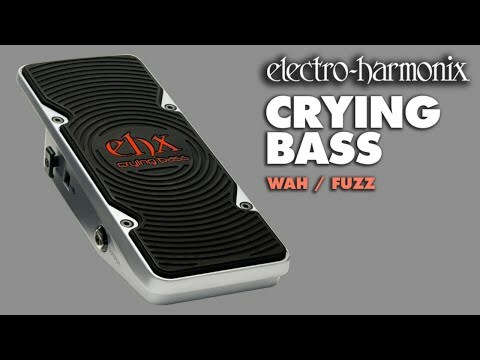 The Crying Bass provides a wah effect that is specifically tailored to the bass, with a few very useful twists. It has a built-in Fuzz effect circuit, with control on the side of the unit, which introduces some higher frequency harmonics. These can work to make the 'wah' effect more obvious, as it is more apparent when these frequencies are filtered out. Or, as EHX put it, ‘it gives the wah filter more frequencies to chew on’. The pedal also features a Low Pass filter circuit, with volume control. This is fixed at 194Hz, and allows the bassist to dial in more bottom-end if required (occasionally, wah pedals can have the effect of ‘thinning’ the bass sound a little at times- this fixes this issue). In use, the Crying Bass is every bit as responsive as its Next Step siblings, but its one-piece construction and lack of moving parts mean that it’s far tougher than other pedals of this type, and stands to have a longer life.